I was in Roslyn Chapel because I read “The Holy Grail, Holy Blood” of Henry Lincoln and two other authors. Lincoln lives now in Rennes-le-Bains. We met and talked with him. He regrets some things he wrote. But Roslyn Chapel shows a leak in Templar knowledge into a new group, who became officially the Freemasons in 1717 after the Catholic church was destroyed in Britain. The interesting thing about this chapel is the features of corn from the Americas even before Colombo. Let’s see what Tony McMahon has to say about it. Being aired on Syfy is the breathless series Legend Quest where ‘archaeological explorer’ Ashley Cowiecharges round discovering mysteries. In the episode I’ve just watched, he fixed his gaze on the Holy Grail and the Knights Templar. OK – let’s take his thesis from the top. The Holy Grail, he says, is the cup Jesus drank from at the Last Supper and then his blood was caught in it during the crucifixion and taken to England by Joseph of Arimathea. It’s not, as Dan Brown, said the bloodline of Jesus – no, it’s a real cup. The descendants of Joseph were the Knights Templar who were then suppressed by the Pope because they became too powerful. They fled to places ‘outside papal control’ including Switzerland and Scotland. 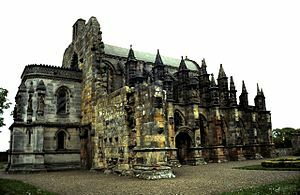 The Holy Grail, Cowie says, was taken to Scotland – Rosslyn chapel to be precise and it was looked after by the Sinclair family. Unfortunately when Cowie shows up, Rosslyn is having repairs done and he can’t get in. So he chats to a latter day Scottish Templar, an amiable old chap, who rather amusingly is subtitled! I’m assuming the view was that Americans would find Scots impossible to understand. In 1446, Sinclair built Rosslyn and the Grail was definitely there says Cowie who has done ‘fifteen years of research’ there. Hidden in a painting of a rather dandified Templar he’s spotted a staircase that gives a clue as to where the Grail was held in the church. He leads the programme producer to the oldest part of the chapel – an eleventh century window. And Cowie has noted a carving there. The carving, he says, is a section of a medieval map. He sees a cup sitting on top of a tower with a line representing the meridien – the Rose line – and he makes out a short horizontal line that is obviously the equator. Diamond shapes are lozenges representing the Sinclair family. And then Cowie imposes this scribble onto a map of the world and a star shape sits over north east America. The star is known as La Merica – which was a star to lead Templars to peace and away from their enemies. The star sits over America. It’s called La Merica. And so…guess where the Grail went. Yep – the New World. The United States. William Brewster, a Pilgrim elder, went to Rosslyn three weeks before the Mayflower set sail in the seventeenth century. A descendant of the original Sinclair gives Brewster the Grail to take to America. So Cowie flies off to Provincetown. He goes to investigate the Pilgrim Monument which – Cowie finds – bears a close resemblance to the carving on the eleventh century window at Rosslyn. Though the Pilgrim Monument was built in 1910 – centuries later – by Theodore Roosevelt. Aaaah – but Roosevelt was…..a Freemason!! The Sinclairs of Rosslyn, Cowie points out, founded the Freemasons. So – Cowie believes he must investigate other Freemason structures built in the US . And he’ll get clues to the Grail. Off to Bunker Hill then to look at a big obelisk. Needless to say – it also resembles the Rosslyn carving. But stranger follows – because this obelisk is the second monument built on the site. The first monument built in 1794 – a model of which is located inside the obelisk is…a pillar with a cup on top – that looks even more like the Rosslyn carving. Cowie is aghast. And he’s convinced that the original monument at Bunker Hill contained the Holy Grail. The more recent monument, completed in the mid-19th century doesn’t house the Holy Grail but – it’s a clue! Why isn’t it at Bunker Hill – because power shifted in the new United States. And so we leave Boston for Washington DC to gawp at the Washington Monument. Freemason clues are all over Washington DC including the White House. But it’s the obelisk that enthralls Cowie who ‘must get inside’. He can’t get a permit to film but ‘that won’t stop him searching inside’. And he bravely enters. Without the crew. He returns and looks at ‘every stone’ and finds nothing – not a single clue. The Grail isn’t there. But then Cowie notes something – the coloring of the stone changes half way up. The official reason that construction of the Washington Monument stopped during the American Civil War and then resumed doesn’t convince Cowie. He thinks this points to the possibility that the Grail was there. A local expert agrees. The Grail was whisked away from the capital during the war for its safety. Clues needed. Map of Washington DC shows a direct line from the Scottish Rite Temple to the monument. Take the Freemason symbol and rotate it a bit and you hit the Capitol building. Cowie stares at the dome and hey presto – there a clue on top. A statue! A female statue! Representing freedom. Built by a freemason, Thomas Crawford. Is she pointing to the Grail? Now – given that the obelisks in Boston and Washington are actually representations of the pillars that flanked the doors of the temple of Solomon – Cowie says we need to find the mid-point, what lurks in the doorway as it were, which turns out to be New York. And the female statue is actually pointing us at the Statue of Liberty off Manhatten. Freedom – liberty – it makes sense! There’s a flame of enlightenment on the model of the top of the model of the original monument in Boston and this is mimicked by the torch carried by the Statue of Liberty. Trouble is – this lady was built by the French. Not a problem it turns out when you consider ‘liberte’ is freedom in French! The original torch apparently came years before the rest of the statue was assembled – giving Freemasons time to instal the Grail within. It’s been replaced but the original is on display in the entrance lobby. Cowie has to get close. He does. Maybe they melted it down into the tip of the flame. The ‘Grail Trail’ therefore leads us here to this new land of America. From the Templars through the Sinclairs and Brewster and into the torch of the Statue of Liberty. It’s the ‘perfect destination’ Cowie says. Melted down and now in the original torch in the lobby. As my partner said – hard to believe the masons would have destroyed the cup held by Jesus – but if Cowie is to be believed…that’s exactly what they did.